The weekend meeting of the finance ministers of the top 20 economies in the world in Shanghai, China was a dismal affair. Before the meeting, the IMF painted a grim picture of the state of the global economy. In its, Global Prospects and Policy Challenges, the IMF economists warned that it would be reducing its forecasts for global economic growth in 2016, yet again. And as the G20 summit met, figures came in for world trade in 2015. It has recorded its biggest reversal since the Great Recession of 2008-9. The value of goods that crossed international borders last year fell 13.8 per cent in dollar terms — the first contraction since 2009 — according to the Netherlands Bureau of Economic Policy Analysis’s World Trade Monitor. The Baltic Dry index, a measure of global trade in bulk commodities, has been touching historic lows. China, which in 2014 overtook the US as the world’s biggest trading nation, this month reported double-digit falls in both exports and imports in January. In Brazil, which is now experiencing its worst recession in more than a century, imports from China have collapsed. Exports from China to Brazil of everything from cars to textiles shipped in containers fell 60 per cent in January from a year earlier while the total volume of imports via containers into Latin America’s biggest economy halved, according to Maersk Line, the world’s largest shipping company. 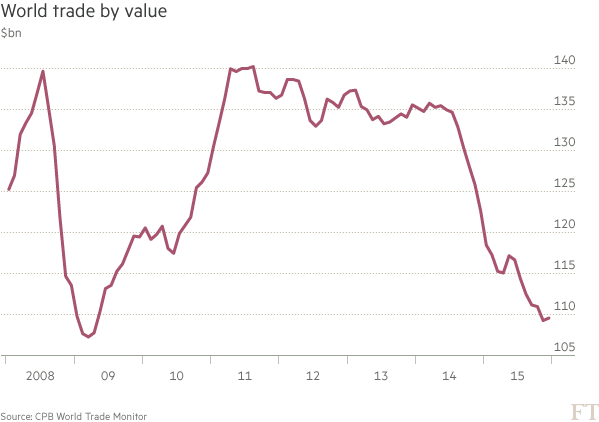 Measured in volume terms the picture was not as grim, with global trade growing 2.5 per cent. But that fell below global economic growth of 3.1 per cent, extending a depressing trend in the global economy. Before the 2008 crisis global trade grew at as much as twice the rate of global output for decades. Since 2011, however, trade growth has slowed to be in line with — or even below — the broader growth of the global economy, prompting some to raise questions about whether the globalisation that has been such a dominant feature for decades has peaked. 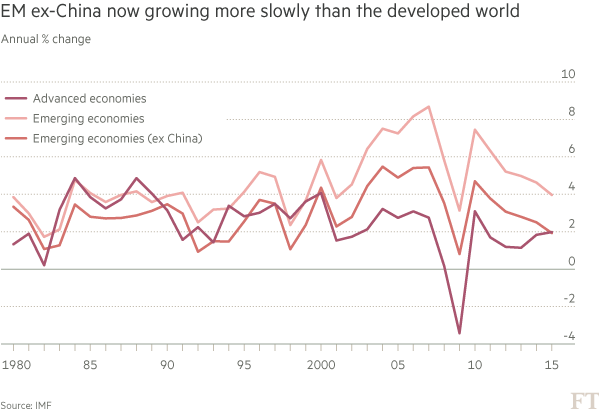 And if you strip out China, the economies of the so-called developing world are now growing more slowly than the developed world for the first time since 1999. Emerging markets (EMs) ex-China eked out output growth of just 1.92 per cent last year, according to IMF data, below even the spluttering growth of the developed world, where output rose 1.98 per cent. This underperformance of EMs vis-à-vis developed countries in per capita terms is starker still because population growth is faster in EMs than in DMs – indeed the latest census for Japan shows that it has lost 1m people in the last five years. On the other hand, as I have argued before on this blog, we cannot confirm a new global slump unless the US economy also starts to contract. And that is not happening yet. In the latest reading for the last quarter of 2015, US real GDP rose at an annual rate of 1% and completed a rise of 2.4% in 2015, similar to that in the UK. But US economic growth is decelerating, led by slowing business investment and losses on trade with the rest of the world. It’s not looking good. As Citibank economists put it, “It is likely, in our view, that global growth will this year once again underperform and, the risk of a global growth recession (growth below 2%) is high and rising. Should the US economy falter, it would be difficult to identify any major economy that could be the growth engine for the world in the near-term. And the forecast for US growth in 2016 has meanwhile gone from 3.0% in January 2015 to 2.0% most recently”. In its G20 Surveillance Note (G20 Note) the IMF concluded that “There is less room for complacency now. Policymakers can and should act quickly to boost growth and plan to contain risks. Coordinating a strong policy response at the G20 level is just as urgent. The G20 must plan now and proactively identify policies that could be rolled out quickly, if downside risks materialize.” At the G20 meeting itself, current Bank of England governor (the best-paid one in the world), Mark Carney reckoned that the “The global economy risks becoming trapped in a low-growth, low-inflation, low-interest rate equilibrium.” The G20 ministers put a brave face on it in their communiqué: “The global recovery continues, but it remains uneven and falls short of our ambition for strong, sustainable and balanced growth,” it said. So what is the way out of this global economic slowdown that threatens to turn into a new economic recession? The search for new economic policy measures to avoid another global slump is on. We have had zero interest rates set by central banks to encourage businesses and people to borrow more; we have had quantitative easing (printing cash and giving it to the banks); now we are having negative interest rates (charging the banks for not lending their cash on to the real economy). But it’s not working. Indeed, at the G20, BoE governor Carney poured cold water over the current solution to the global slowdown offered by several central banks, namely negative interest rates. These moves by central banks to cut interest rates below zero risked creating a “beggar-thy-neighbour” environment which could leave the global economy trapped in low growth. Negative interest rates mean customers effectively pay a fee for parking cash in banks, so Japanese citizens are beginning to hoard yen, according to the Wall Street Journal, and they need somewhere to put it. Sales of safes have doubled from the same period a year earlier at chain hardware store, Shimachu, according to the Journal. The chain has already sold out of one model worth $700. Others savers are considering more unconventional storage spaces. “In response to negative interest rates, there are elderly people who’re thinking of keeping their money under a mattress,” So people are saving money rather than spending. The majority view at the US Federal Reserve is not so pessimistic. Vice Chair Stanley Fischer still hopes for US economic speed-up. Fischer said: “If the recent financial market developments lead to a sustained tightening of financial conditions, they could signal a slowing in the global economy that could affect growth and inflation in the United States. But we have seen similar periods of volatility in recent years–including in the second half of 2011–that have left little visible imprint on the economy, and it is still early to judge the ramifications of the increased market volatility of the first seven weeks of 2016.” So it would be a mistake to launch NIRP in the US. “Monetary policy should aim to avoid such risks and keep the expansion on a sustainable track”. Nevertheless, the voices of doom among economists and policy makers are getting stronger. So now the talk is for what is called ‘helicopter money’ (just handing over cash to households to spend) and/or fiscal stimulus (increased government spending and tax cuts). I have commented before on the nature of ‘helicopter money’ named after the idea promoted originally by monetarist economist Milton Friedman and his follower, former Federal Reserve chief, Ben Bernanke, that the monetary authorities could simply drop piles of cash out of helicopters onto the country to be spent. This money out of air (literally!) would lead to a huge boost in consumer demand and that would get sales, incomes and profits going. This idea got more traction when Adair Turner, former head of the UK’s financial regulation authority, promoted it in his book Between Debt and the Devil, of course, in reality implemented by adding funds to people’s bank accounts. This ‘solution’ is now being promoted as the last throw of the dice by the likes of Martin Wolf and Gavyn Davies, the Keynesian economic columnists of the UK’s Financial Times. We get a similar argument from the advisers to the Bernie Sanders US presidential campaign (and for that matter from advisers to the Corbyn-McDonnell Labour opposition in the UK). Get money directly to the people and this will stimulate consumer demand and the economy will leap forward because there is plenty of pent-up demand waiting to be released. So weak demand causes lower investment causes lower growth. But is that the order of causation? In this blog I have argued consistently with evidence that the Keynesian premise is wrong: a lack of aggregate demand in a national economy or globally is the result of a slowdown or slump, not the cause. The slump comes from a collapse in investment (in particular, business investment) and that happens when it is no longer profitable to invest. Profit calls the tune, not ‘demand’. The key point right now in the current global slowdown is the Keynesian analysis says that the problem is a lack of aggregate demand and increased government spending through the Keynesian demand multiplier can do the trick. But the Marxian analysis says that it is profitability of investment that is key to capitalist-dominated economies and that it is the Marxist multiplier of profitability that can do the trick. The problem with the latter is that profitability can only be restored through the destruction of value by stopping investment, liquidating old capital and making millions unemployed. That is the contradiction of capitalism that Keynes did not recognise, along with all mainstream economics. Achieving this may involve driving up wages and interest rates, he says, but only to “historically normal levels.” So give people more wages to spend more and demand will shoot up. There is plenty of slack in the US economy: people without jobs and businesses ready to invest. Indeed, higher wages would force businesses to invest in new labour-saving technology and drive up productivity growth, which is currently languishing at record lows. Friedman’s arguments were subjected to a clinical critique by mainstream economists, Christine and David Romer, romer-and-romer-evaluation-of-friedman1. Their main point was that boosting demand in the way Sanders-Friedman claim would not deliver the growth result because the capitalist economy did not have the ‘demand gap’ claimed and the ‘productive capacity’ of the US capitalist economy was too weak. In other words, the US capitalist economy could only grow at 5% a year in real terms for the foreseeable future if it could expand investment and raise the productivity of labour over the next ten years. And boosting demand won’t do that. Of course, the Romer pair had no alternative to their critique of the Sanders proposals. Anyway, government policymakers around the world are refusing to launch such fiscal spending programmes, even though infrastructure spending in Europe and the US is at 30-year lows and bridges, roads and railways are crumbling before our eyes. According to the 2013 report card by the American Society of Civil Engineers, the US has serious infrastructure needs of more than $3.4 trillion through 2020, including $1.7 trillion for roads, bridges and transit; $736 billion for electricity and power grids; $391 billion for schools; $134 billion for airports; and $131 billion for waterways and related projects. But federal investment in infrastructure has dropped by half during the past three decades, from 1 percent to 0.5 percent of GDP. Why do governments refuse to introduce such policies in a meaningful way? Well, it’s because government spending means more taxation on the corporate sector and/or on households, or it means more borrowing when public sector debt is at record highs. And it means the encroachment of government into the capitalist sector just when profitability is turning down. Monetarist solutions to the global slowdown have failed; Keynesian fiscal solutions are not being introduced and would not work in the long run anyway. The only way out is another slump. This entry was posted on February 28, 2016 at 8:19 pm and is filed under capitalism, economics, marxism, Profitability. You can follow any responses to this entry through the RSS 2.0 feed. You can leave a response, or trackback from your own site. Another great analysis, I appreciate your clarity in the chaotic din of neoclassicism and Keynesian nonsense. However, as I talked about in my own blog, traditional means of liquidating old capital through foreclosures, debt collection, using various options in derivative futures agreements, mergers and acquisitions, etc. are no longer the only ones possible in a post-Dodd-Frank world. And what better, what more abundant a source of capital than the “too big to fail” banks that fall under the Orderly Liquidation Authority of Article II. My question is this: assuming that the slowdown in investment will grow, if the government actually utilized OLA to liquidate a bank, would mass unemployment still result per se? I know using OLA is almost politically impossible, but I’m just curious if it is worth stating when inevitably OLA isn’t done and harm results. “So weak demand causes lower investment causes lower growth. But is that the order of causation?” Those words–the order of causation–are the mark of a totally undialectical concept of single causation. Every business cycle is characterized powerfully by unique circumstances, and those three aspects of its recession stage are entirely interdependent. Every ordering of them states an ongoing process every stage of which can see every one of them taking a “leading” role. But what is not part of the causal process is the long-term tendency in the pure Marxian model of capitalist development for the rate of profit to fall. Remember that in that model all surplus-value takes the form of profit-of-enterprise. But for a long time now the state-monopoly-capitalist economies have quite disregarded that model, Nowadays, the profit share of surplus-value is low and constantly falling relative to rent (including extractive rents) and interest (including “speculative” profits “guaranteed” by central-bank inflation of securities and raw-materials prices). In analyzing the ecological and financial contradictions of this global economy as it collapses into another recession without ever having emerged from its long-cycle depression, Herman Daly and Hyman Minsky are perhaps more relevant than Karl Marx. What you basically just said was that business cycles (something that repetitively occurs) cannot be understood in a general way because of the ungeneralizeable causal forces–or in other words Marxist is a pointless endeavor. Someone should reread Marx, his battles with Smith and Ricardo. Marx disproved the long-term TRPTD. Unfortunately, it seems that the only way out is not just “another slamp”, but the further expansion of the war that is already engulfing the world. Chaos spreads from Africa to the Middle East. The numbers of refugees globally have hit record heights. War by proxy and/or special ops is the order of the day, not to mention the NATO/Russia relations and the Sino/American crisis in the far east. If the peoples of the world and the international working class do not take action, i very much fear that the kind of “creative destruction” that awaits us will be far worse than just the economic manifestation of the phrase. “latest census for Japan shows that it has lost 1m people in the last ten years.” The loss was over the last five years. As for the Sanders program, see Senator Sanders and the Impossibility of Reviving Democratic Party Liberalism. Thanks for the correction – I had done it from memory. The biggest problem for ‘developed’ economies is low wages which results in returns on capital that are less dependent on productivity growth (and overall growth in the economy). Economists hitherto have only interpreted the world in various ways; the point is to change it. What is the definition of the word “world” presupposed in your usage? The world of human interaction, the world of human relationships fosforos. “The value supplied (but not yet realised) and the quantity of iron which is realised, do not correspond to each other. No grounds exist therefore for assuming that the possibility of selling a commodity at its value corresponds in any way to the quantity of the commodity I bring to market. For the buyer, my commodity exists, above all, as use-value. He buys it as such. But what he needs is a definite quantity of iron. His need for iron is just as little determined by the quantity produced by me as the value of my iron is commensurate with this quantity. I think that you are making the same mistake that Marx criticised others for in these references, which is to conflate value and use value, the determinants of demand (use value), and of supply (value). As a consequence you end up with a version of Say’s Law, in which you assume that all that is important are the conditions of supply determined by value, and you then assume that demand automatically appears to soak up what has been produced at the resultant prices. The only way out is another slump…or socialism. Falling prices for raw materials cause a temporary disproportion as investments predicated on those high prices are cancelled, and the profits the yielded disappear. But then falling prices lower the organic composition of capital, raise the rate of profit and increase aggregate demand. How is this bad for the economy? Except of course, this is immaterial, as the recession’s coming this year, next year or the year after that, etc. Ad infinitum. Moreover Bill, as you so presciently pointed out about a year ago, the decline in oil prices, lowering input costs for production, was bound to be a veritable boon for consumers and industrialists alike. Remember that? And two or so years ago, you were telling us how the maritime transport industry too was booming. Remember? And you weren’t alone, were you? Not just Boffy, but even the head of the ECB, Mario Draghi was describing the decline in oil prices as a positive positive for the economy. But none of that matters, does it, as the economy’s underlying strength will assert itself this coming year, or next, or the year after that. Ad nauseum. Actually they lower the value composition of capital, not the organic composition. In Capital I, Marx sets out that when he talks about the organic composition, he means the relation between the constant and variable capital primarily determined by the technical composition, i.e. the physical mass of material processed by a physical quantity of labour measured in value terms. Marx makes this distinction for several important reasons. Probably most importantly is that for Marx capital is the social relation between capital and wage labour. As he goes on to say, the expansion of capital is the expansion of this relation, and so the expansion of capital, is the expansion of the working-class. The primary driver of that, as he describes is not the value of capital employed, but the physical mass of capital employed, given any technical composition of capital. As Marx says workers have to do with the use value of the means of production they confront, not the value. Flowing from that, then is also the importance of distinguishing whether changes in the organic composition of capital flow from a rise in productivity, which changes the technical composition of capital, and thereby the organic composition as a result, or from a reduction in the value of different components of capital, as set out in Vol III, on the relation between the rate of surplus value and rate of profit, and in Chapter 6 on changes in those values directly on the rate of profit. If the technical composition rises as a result of rising productivity, then this may cause the occ to rise, creating the conditions for the law of falling profits to operate, depending upon the other effects it has on raising the rate of surplus value, reducing the values of constant capital and so on. For the reasons Marx sets out, it will lead to an expansion of capital, but the extent of the expansion will itself be affected by the very fact of the rise in productivity, which means that dependent on the structure of capital, at the particular time, it may result in absolutely more or less labour being employed. If the value of materials, which comprise the largest element of constant capital fall – or as Marx sets out in Chapter 6 if their market price falls, because of over supply – then the value composition of capital will fall, even though the technical composition, and so the organic composition has not changed. It may require as many workers to process 10000 kg of flax into yarn, after this change as it did before, but the price of the flax has fallen, so the value organic composition falls. That is important, as Marx sets out, because if the price of flax falls, spinners can buy more of it, to spin into yarn. But, if the technical composition has not changed, this increase in the amount of flax to be spun, requires the same increase in the employment of spinners as before. The fall in the value of the constant capital, creating a release of capital, allows more means of production and labour-power to be employed, creating an expansion of capital, of surplus value, and of the rate of profit. In some nations the domestic consumer subsidises business UK is a prime example). The problem with this is that a fall in oil prices helps somewhat the domestic consumer but not much the business! And it is infamous that prices are sticky coming down but very responsive when going up! So the middle men see the biggest benefit of all! being a finite resource oil is bound to increase in price again and the domestic consumer will once again subsidise business to a large extent. Regarding investment decisions, I think most companies will employee people to look at expected future cost, expected future sales, expected future profit, and any other ratio you can think of. After all we are in the era of big data and cloud computing. Bill may think forecasting is a wild goose chase but that doesn’t stop every company on Earth doing it and being obsessed by it. Most companies will have instigated certain measures to assume forecasts become real. Risk planning for example. If demand was the heart of every crises then the old William Beveridge formula of socialization of demand without the socialization of production would suffice. My understanding of Marx is that crises are the mechanism to restore ‘equilibrium’ to capital accumulation. Not simply some response to a demand shock. Who’s gloating? Not me. Hell, I’m the guy who forecast Carter beating Reagan. Institutions and corporations only really forecast their immediate environment and they are good at this until something really unexpected occurs, Marxists are analyzing the system as a whole. I would argue Marxists are not really forecasting but they do make predictions – these are different things. This is one of the areas where Bill jefferies gets confused. The biggest indicator of how well big capitalists forecast is the market value. Markets have never predicted a crisis but they certainly let you know when one has arrived. That depends on the Marxist Graham, it depends on the Marxist in question.